I’m 16 years old, and I’ve always found comfort and a sense of peace working with rescue animals. 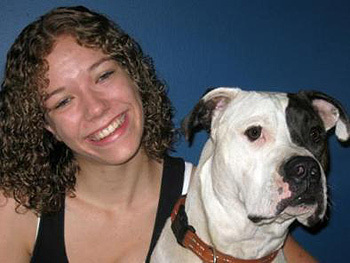 This was especially true following the death of our beloved family dog Maggie, a Boxer/pit bull mix. For a while I was inconsolable. Maggie had been my best friend, and I missed her terribly. Luce was surrendered to our local humane society in an unwanted litter. The entire litter had been adopted, except for Luce and his brother Zeus. And while the brothers were undeniably the cutest puppies there, they were also the worst behaved, especially Luce. While the shelter staff was dedicated to the care of their animals, they simply didn’t have the time or resources to properly socialize them. That’s where we came in. My older sister and I made it our mission to visit the shelter as often as possible, usually three to four times a week, to spend time with Luce and Zeus. Over the course of three months, we spent countless hours with the boys and did our very best with them. It paid off. Luce and Zeus both made huge improvements, but we were also faced with a difficult dilemma. We had fallen totally in love with them. After much cajoling and sweet talking, we convinced my mother to adopt one of them. We picked Luce over Zeus – our reason being that he was phenomenal with my little sister who was terrified of dogs. He showed an incredible amount of understanding and self control around her. I had never seen a dog act the way Luce did. Luce adjusted to life in a home really well, although we learned he had a taste for destroying remote controls and eating stuffed animals! As Luce grew up, we began to realize we had a really special dog. 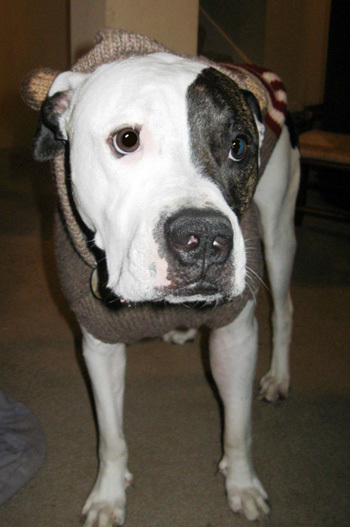 While we were immensely proud of our sweet, well-behaved dog, we began to be faced with increasing prejudice from the outside community because Luce was a pit bull. Fortunately we connected with Game Dog Guardian. Game Dog Guardian is a non-profit organization that works to better the lives of pit bull type dogs and their guardians. Once we became involved with the wonderful folks at Game Dog Guardian, things completely changed for Luce. Game Dog Guardian taught us to understand and become aware of the issues Luce faced and helped us become good advocates for the breed. They also introduced us to our second pit bull and the wonderful world of fostering. 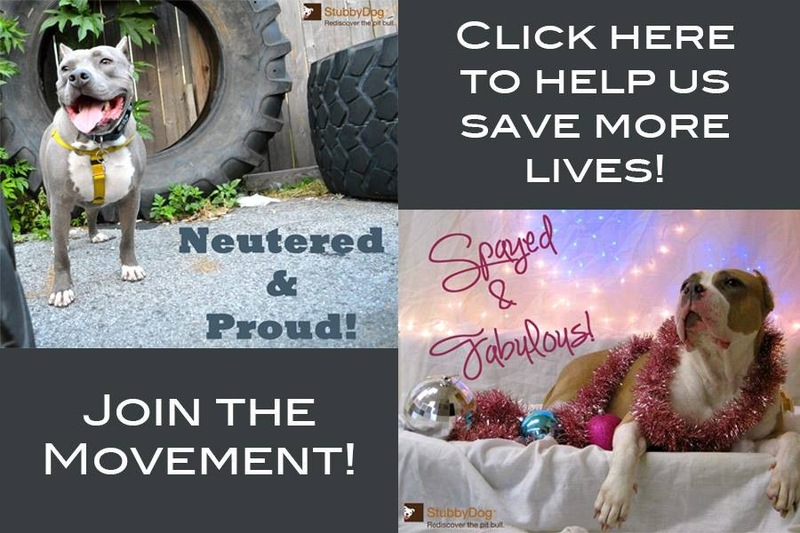 Since adopting Luce and becoming involved with pit bull rescue work, we have adopted two more pit bulls, Penelope and Wayne, and fostered both a deaf pit bull, Reggie, as well as a cruelty victim survivor, Susie Shortcake. Luce had been really important to the success of all these dogs. 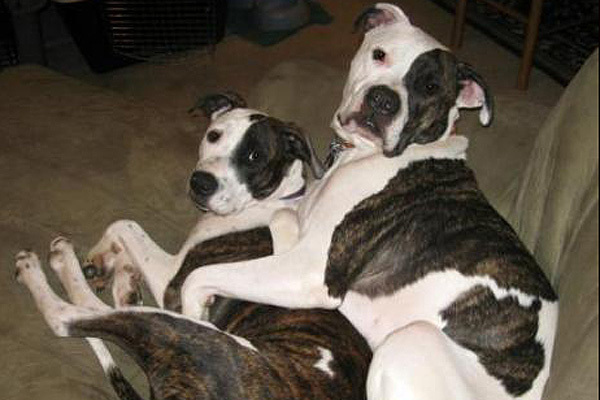 We learned after adopting Penelope that Luce had a natural paternal instinct to guide and help our other dogs. While watching Luce’s interactions with both humans and canines it hit me: Luce would be a terrific therapy dog. So I made the decision to embark on an almost eight-month journey to get Luce registered as a Delta Society therapy dog. With lots and lots and lots of training and help from many people, Luce and I became registered with Delta Society in October of 2011. I have never been more proud of Luce than I was the day that he passed his certification test. We’re stoked to begin visiting our community. Luce is more than just a dog to our family. Luce is a best friend and a treasured family member. If it were not for Luce, I may never have had the opportunity to meet so many wonderful people or to help so many deserving dogs. We gave Luce a safe and loving home; in return, he has given us his heart and soul. Adopting Luce was one of the best decisions we ever made. what a beautiful story! thanks for sharing it. i am so inspired. @rachelelisabeth Mara is quite inspiring and she’s only 16. Just imagine all she will accomplish! Love it! We are also with Delta, and Katie at GDG is a good friend, thank you for telling Luce’s story, you guys are an inspiration, and what a gorgeous dog! This is the most inspiring story ever. I have had my it bull one month – adopted with Karma Rescue from the West LA Pound in California. Because of prejudice and breed hatred and people cruelty and ignorance my neighbors in my town house condominium – who let their tiny dogs run around unleashed- my dog and I were attacked while walking the first five days I had him. We both fell and I can’t walk. I did something to my knee when I fell and gashed my head and am waiting for the results of the MRI. It is not broken or fractured. I am in terrible pain. Once this is all fixed and I am up and about I am going to look up the organization you talk about and see what they can do to help me. My dog never lost his cool during the attack or tried to kill the attacking dogs.Thank you for sharing this. Best to you and your pooch! Hang in there, you are not alone! I <3 this story so much! Mara is wonderful! !The work that she has done with Luce is amazing and the work her whole family has done with Game Dog Guardian is awesome. Thanks to Mara last March we welcomed a new member into our family. Reggie has been a life changing experience for us and every day we are thankful for the joy he gives us! @lachrystalricke Aw, that’s so incredible, just one example of how we all can pay it forward. But what happened to Zeus? Was he adopted as well? From the looks of the pictures posted, it seems Zues was adopted by Mara and her family too. Was he? If not, what happene to him? I’d really like to know! 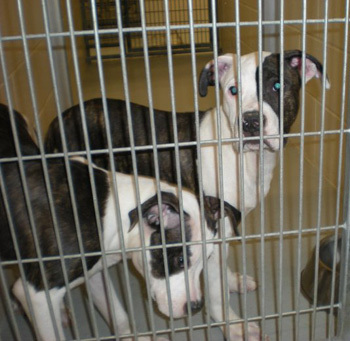 @mizcaliflower We don’t know why they didn’t adopt both, probably one dog was all the could take at the time. The fact is they did such a great job with Luce that it allowed them to adopt others down the road. Plus both sisters did so much for both Luce and Zeus in the shelter. That is what should be applauded. @mizcaliflower Thank you, we are huge Honey fans over here. I misunderstood the timeline, I guess. I thought they adopted Luce and a different dog, at the same time. @mizcaliflower No worries, we just didn’t want the curiosity of what happened to Zeus to overshadow the amazing accomplishments of Mara and Luce.